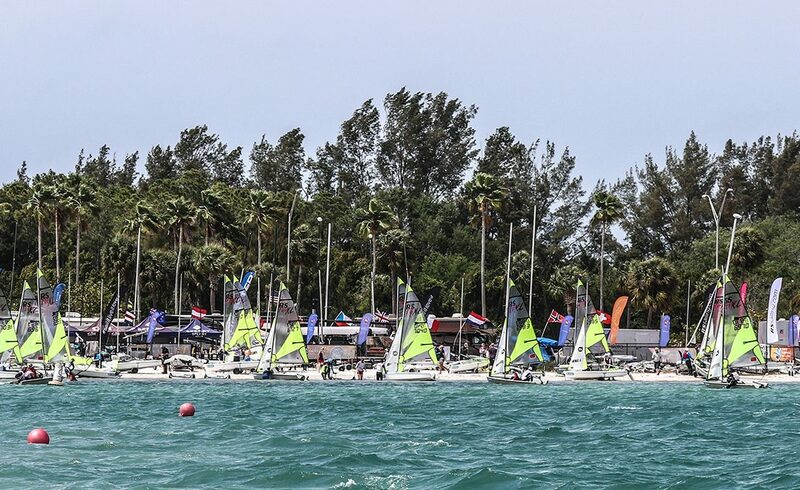 On the last day of racing there were 4 points separating the top 2 boats and clearly both teams were nervous as the fleet headed out under the bridge into the gulf. The breeze was very light but the PRO was determined to try and get the final races in. The course was laid and the sailors were soon in sequence. As the fleet crossed the line, what breeze there was faded away and within a few minutes of the start the PRO had no choice but to abandon. The fleet rehydrated and additional sun cream was applied as they drifted about waiting for the forecasted breeze to appear. The PRO ordered the media boat, affectionately known as the ‘Mediocre Boat’ into the fleet to entertain the frustrated teams. 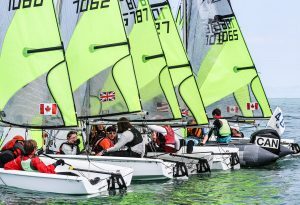 The loaned Mediocre boat was fitted with a huge sound system and the fleet was encouraged to dance, swim, dive and simply have some fun. Check out the Facebook Live here. At 1pm after a lengthy discussion between the PRO and the RS Feva Class the decision was made to abandon for the day as there was no sign of the forecasted breeze. As the flags were hoisted the cheers rung out around the gulf from all the relieved sailors and the celebrations could begin. 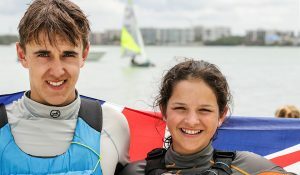 The RS Feva class had new World Champions, overall & mixed team Ben Hunton-Penman and Abi Jayasekara, Ladies Annie Hammett and Emma Wells, Boys Tom Storey and Rupert Jameson, Junior Femme Rijk and Silke Zuidema and the family title going to William Caiger and Becky Caiger. Check out the Facebook Live here to watch all the celebrations. 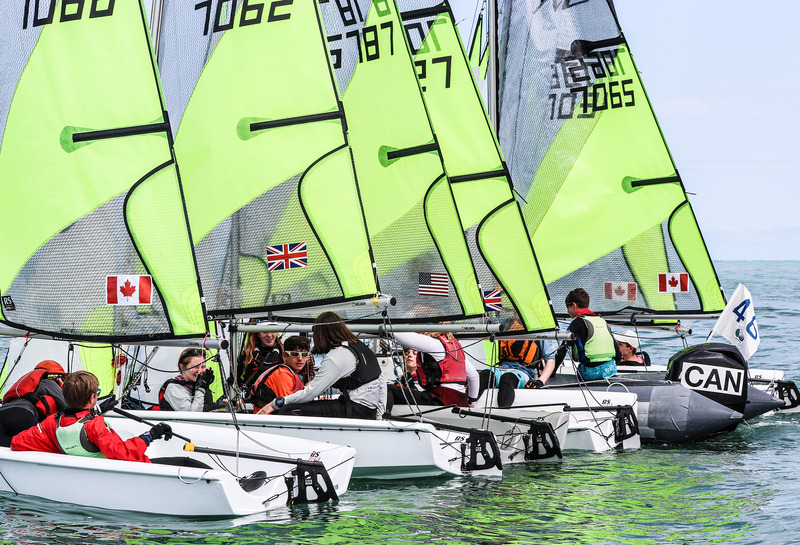 It is amazing to see the strength of the RS Feva Fleet worldwide with 5 nations represented in the top ten. Ben and Abbey absolutely deserved their title. The USA Team Dieter and Conrad also sailed an outstanding week – tough competition and only 2 points between first and second. The boys sailed extremely well. Tom and Rupert only just missed out on overall title so extremely worthy winners of the Boys title. The Dutch team Hanna and Bente were absolutely the stars of the show on ‘Super Saturday’ posting top 5 results all day. It’s always lovely to see family teams enter the Worlds and we think it’s quite unique. 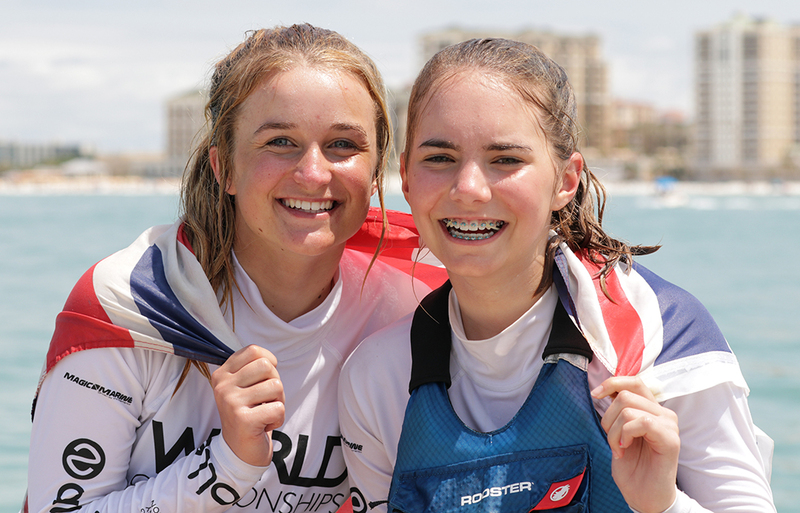 The Chinese girls are actually twin sisters, which make them the second set of twins the RS Feva Worlds has seen enter.